Armon David Pope was born in Booneville, Mississippi, on May 15th,1922. He lived and went to school there, graduating from Booneville High School in 1940. He enrolled at Mississippi State College, and pursued a degree in Mechanical Engineering, only to be interrupted by the events of December 7, 1941, when the Japanese attacked Pearl Harbour. When he volunteered in the Army, he intended on becoming either a pilot, or navigator. He finished his pre-flight training in Buffalo New York in March 1944, but instead of becoming an officer and aviator, the Army decided they needed more ground troops for the invasion of Europe. Armon was assigned to the Company G in 2nd Battalion of the 39th Infantry Regiment of the 9th Infantry Division. He he was assigned to be a B.A.R. 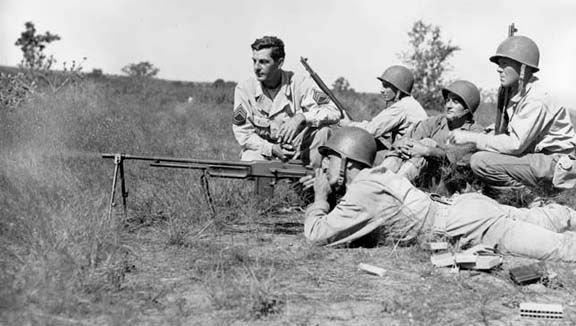 gunner, the bigger Browning Automatic Rifle, just in time for the push into the Huertgen Forest. 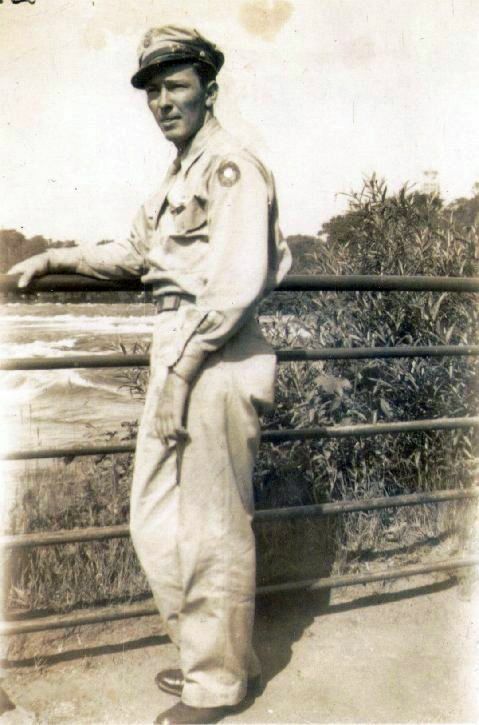 He remained with that unit until January 31, 1945 when he was wounded by gunfire. Hospital Admission Card and newspaper clipping. 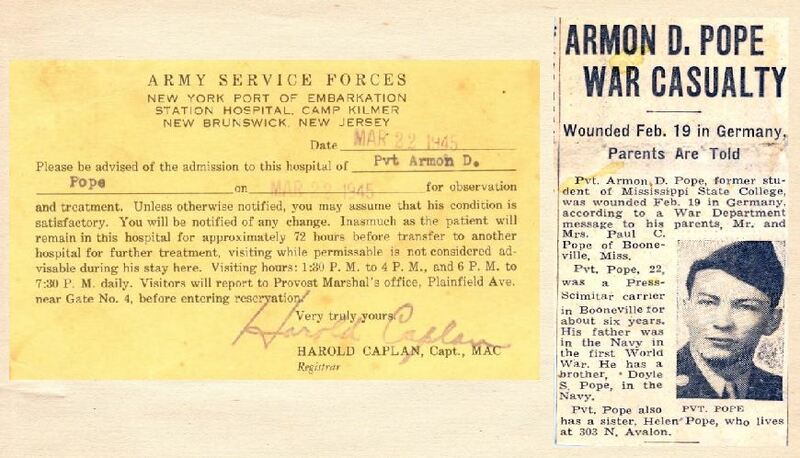 Please note, Private Pope was actually wounded on January 31st, 1945, and not on February 19th 1945 as is stated in the article. After recovering from his wounds, he eventually moved to Lawrenceburg, Indiana to work for Segrams Distillery as an Engineer. This is where he met Barbara Lowe, and they were married. His career became one in the Defense industry (Gruen Watch, Company, Honneywell, Martin Company, Litton Laser,etc). Armon had 4 children, and in 1957 moved to Clearwater, Florida, then to Orlando, Florida, where he lived out the rest of his life. Armon loved boating and fishing, spending many days on the water traveling to the Bahamas, or deep-sea fishing, or water skiing. He loved working on motors, and was a very, very smart man. In about 1993 he traveled to Europe to try and re-visit some of his steps while fighting into Germany. He was a member of the Ninth Infantry Division Association. Armon came from a long line of pioneers, his family settling in Alabama and Mississippi, in the early 1800’s, having direct ancestors fighting in the War of 1812, the Indian Wars, and Civil War, and WW1. He was a true American. Sadly, Armon became sick in the late 1990’s and lived out the rest of his days in a nursing home. With his wife at his side on May 3, 2006, his spirit left this world. Armon David Pope is buried at Florida National Cemetery in Bushnell, Florida, in a simple soldier’s grave along with thousands of other American hero’s. 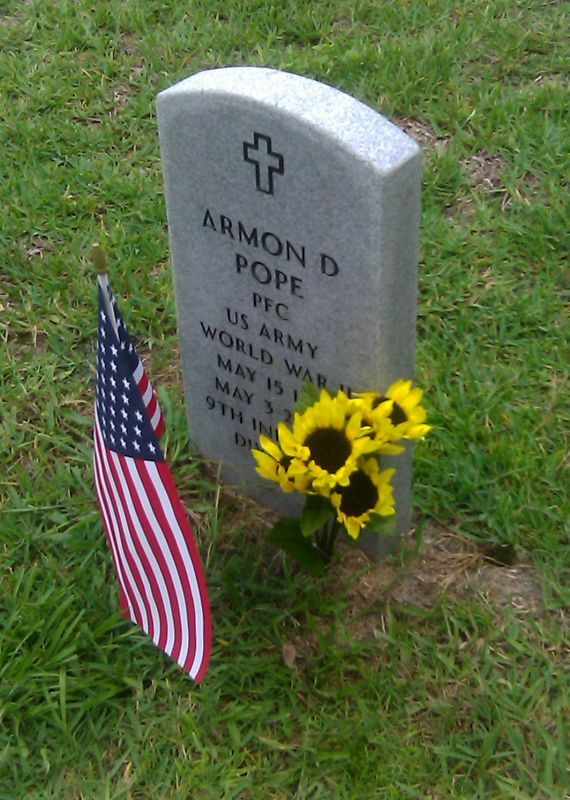 Armon D. Pope’s gravestone at Florida National Cemetery in Bushnell, Florida. Private Pope will always be remembered.